Nowaday, it is too normal for people spending a long time siting front of the table to work or play! For a long time and without any change, your neck, shoulder and back would take a lot of stree, and feel ache! So, You just need to Stand! As the experiments said, standing provides several health benefits for the body such as increased blood flow and enhanced posture. Ergonomic design also protect your spine from bending - this is a speacil design compared with other's! Not Assembly Required - Take it out of the box and then you are so close to build a balance health for yourself. 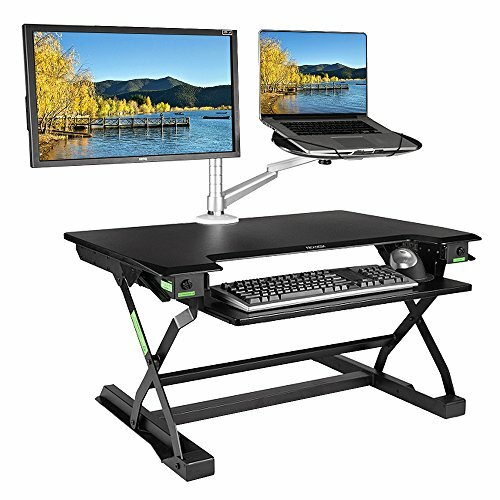 Adjustable Height: 4.7" to 20"
[Ergonomic and Healthy]: With its Dual-Tier Mode, the workstation is adjustable, letting you place your monitor, keyboard and mouse on different decks for streamlined functionality. This guarantees perfect working positions while sitting or standing. [Stay Active]: Benefit from the healthy advantages of a flexible work desk. Choose your best working position and transition quickly using the simple gas spring lift system (adjustable range: 4.7" to 20" approx). [Large Work Space]: Stay focused and keep your workstation organized thanks to its spacious work area. The top surface measuring 35" x 23.6" helps setup single or dual monitor, or laptop + monitor effortlessly. Spread and access your files, folders and all other paperwork quickly without wasting time. [Benefits]: ✔ Cable management system for your desk clean; ✔ Choose from 15 height levels Setting as you transition between sitting and standing throughout the day. Our products support a better posture and healthy wrist and arm positions. Plus, our desktops are compatible with ergonomic monitor mounts; ✔ 5 level design for you to adjust tension knob to aid lifting for various surface weight! [High Quality Construction]: Support up to 40lbs, has undergone extensive testing for balance, stability, and movement. The work surface is made of an environmentally friendly medium-density fiberboard, which meets the high standards of the California Air Resources Board. If you have any questions about this product by MINICUTE, contact us by completing and submitting the form below. If you are looking for a specif part number, please include it with your message.